The first graffiti appeared in Philadelphia in the sixties, but it was in New York that it proliferated and eventually crossed the ocean to infect Europe. It is visible in all cities, on historical palaces and house façades, on train and tram coaches; writings, murals, narratives of metropolitan life. It may be considered a form of art in many places, but graffiti is often perceived as simple vandalism. At El.En. SpA (Calenzano, FI), a world leader in industrial and medical lasers and the creator of lasers for fine art conservation, an idea was born to create a powerful laser for the removal of graffiti. The so-called “Graphiti Kommando” now belongs to the Angels of Beauty, a non-profit foundation that works to preserve and protect the beauty of the city of Florence. Laser Blast, the name of the new-generation equipment, is a fiber laser with high brilliancy that is easy to use and transport and creates a powerful light that selectively removes the most common paints used in graffiti . In 2012, Florence designated a series of public places for graffiti writers to freely draw and paint. However, they have continued to move past these spaces. Respect for the historic beauty of the capital city of Tuscany gave El. En. the idea to create and donate this new laser to the city of Florence. The donation also creates a strong alliance with the Angels of Beauty who are working to protect Florence, and contributes to their mission to relaunch the majesty of Renaissance and combat the vandalism of graffiti. The El.En. Group is not new to making donations that go beyond intrinsic utility and also have a strong symbolic meaning. Recently, in cooperation with their subsidiary Quanta System SpA, a fine art restoration laser was donated to the J. Paul Getty Museum of Los Angeles. This donation was made in memory of Khaled Al Asaad, the Syrian archaeologist brutally killed by ISIS defending Palmira from destruction. Several other lasers have been donated to the Vatican Holy See for the restoration of the Vatican Museums and the Apostolic Palace. “Now, it is time for Florence, a crown jewel of Italy which desires to ransom itself from degradation. This laser of rediscovery and Renaissance serves a strong civic mission,” declared Angelo Bove, the El.En. researcher who designed the new laser. The equipment is “100% Made in Italy” and will soon begin its work of restoration and renewal in the Galleria della Carrozze (Coaches Gallery) at the Santa Maria Novella Train Station of Florence. Florence Italy’s Angeli del Bello, or Angels of Beauty, founded in 2010, has a mission: to keep Florence beautiful. The volunteer organization, a partnership between Quadrifoglio SpA and Partners Palazzo Strozzi, not only has the support of the Comune di Firenze and the Regione Toscana, it has captured the attention of thousands. 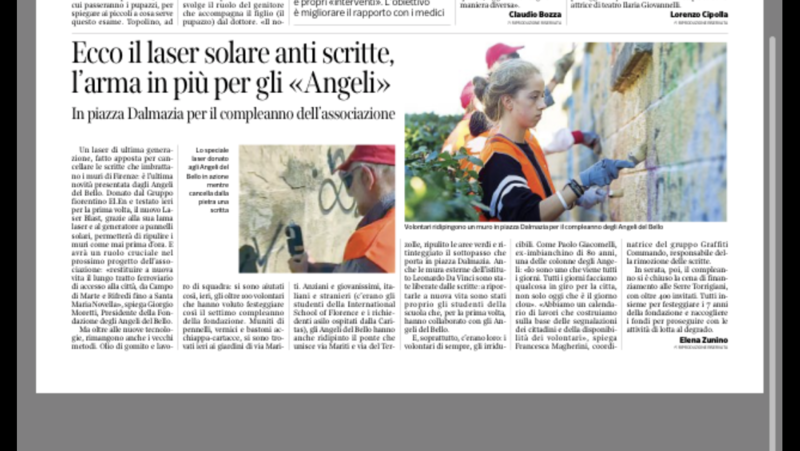 Currently it counts 2,500 volunteers—citizens young and old, foreign students and expats, and, increasingly, people from all over Tuscany—actively working every day to remove graffiti and to maintain outdoor spaces throughout Florence. Italians know beauty; the Angels are here to preserve it. EL.EN has been listed on the Star (MTA) of Borsa Italiana. Its market floatation is approximately 41% and its market capitalization amounts to Euro 460 million roughly.